It’s so fun, naming dolls. 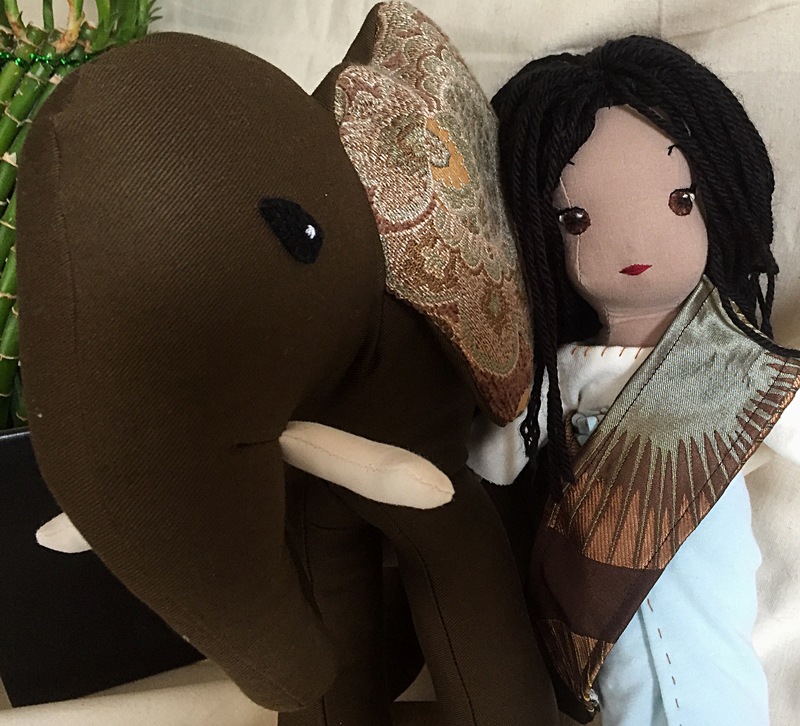 I haven’t really done it in the past, figuring that most people like to name their own dolls. But there’s something about these sculpted waldorf dolls. Something about all the labor that goes into them- the starting with a simple wool sphere and somehow sculpting a face out of it with no pattern. It makes the creative process seem, well, more creative! Each face slowly emerges under your fingertips and is so individual, you just have to name it! I chose the name Marta because it reminds me of things soft and sweet and loveable and this girl is just that- all pinks and pastels and it brown eyes and soft, fluffy clothing. I’m just gonna leave a photo dump here and you can let me know what you think! She’s on my shop now! Hello dear friends! I’m blogging! Is that still a thing people do? Do people still take the time to click on a link that takes them to another site and away from their news feed? I don’t know. Nor do I know if a blog is still a good way to advertise one’s product. I suspect it’s not. 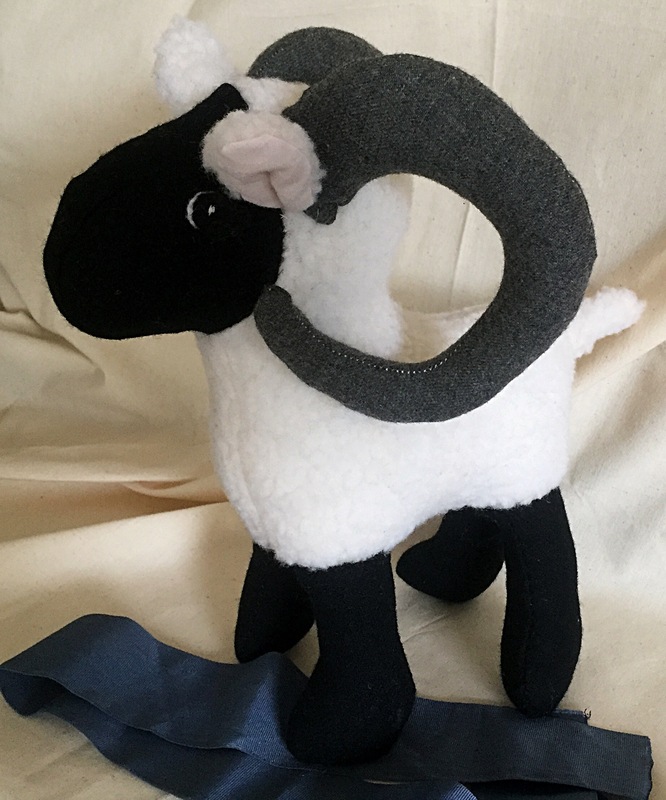 But I am going to do it anyway, just as a means to update those of you who might be interested in my Etsy shop. But I think from this point I will be doing most of my advertising via social media. If you follow me on Facebook or Instagram at all, you know I have been contemplating opening my shop again after a looong hiatus. I’ve debated the pros and cons, told myself I have too much on my plate to tackle sewing right now and generally hesitated to jump back in. – and, well, money. Spare cash is always acceptable. Of course I am busy. I have five kids. I homeschool. I work part time for my church and our house is still in process of remodeling. 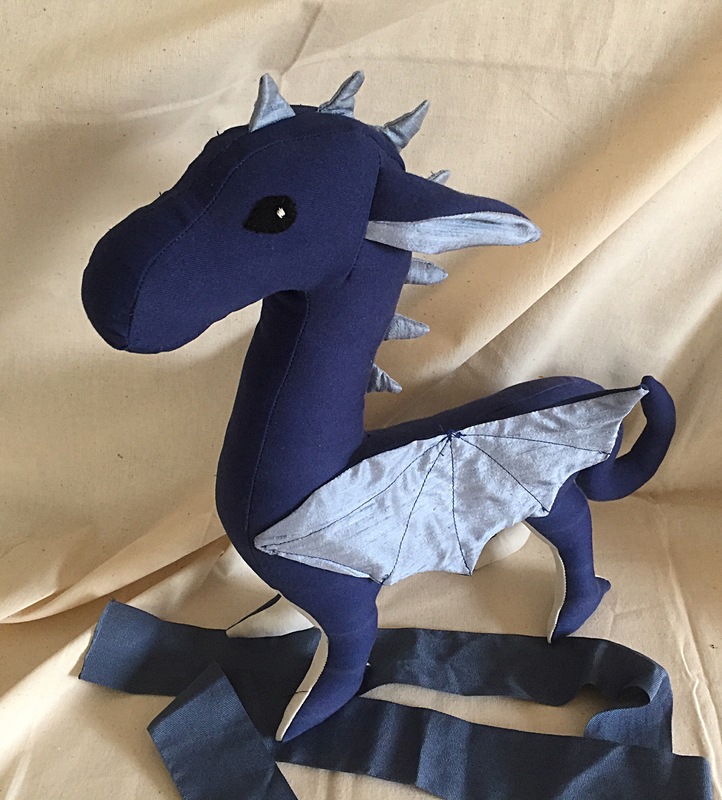 But I figured if I had a few spare minutes, I would just sew what I had time for, have some fun and not stress about it. There are some things I learned from the last time I was selling dolls etc. 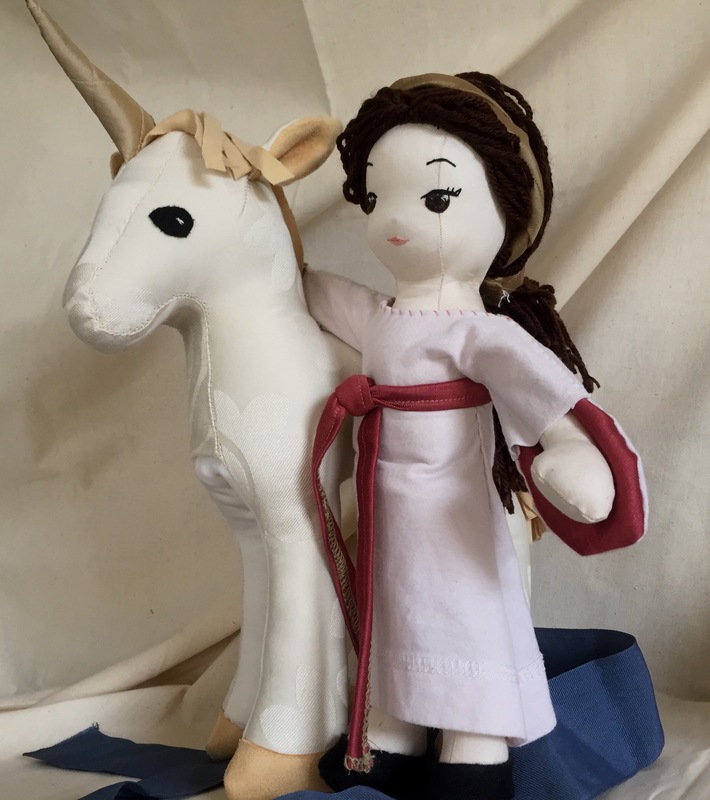 Most people aren’t going to shell out money for an expensive doll unless its Christmas or some other really special occasion which always made the Christmas season more than a bit overwhelming. 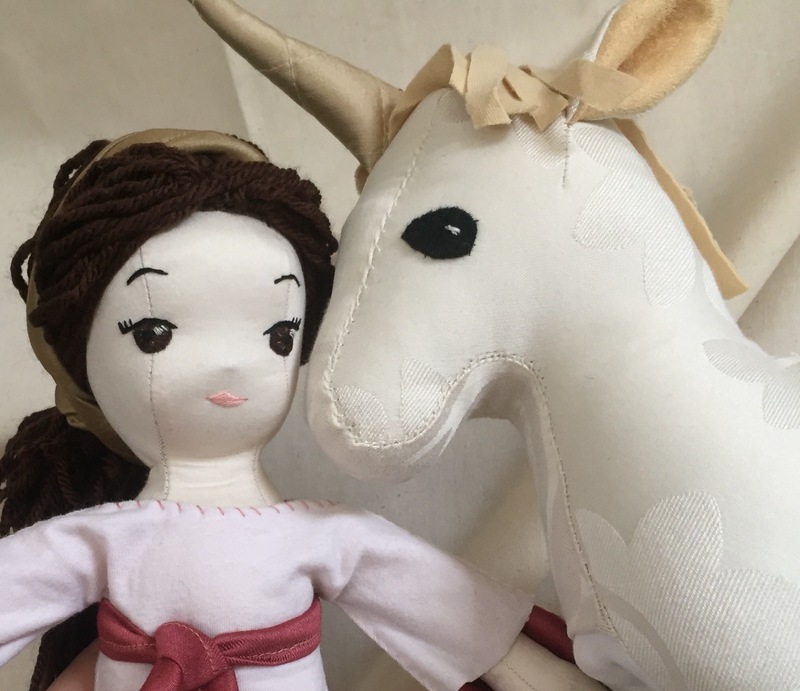 Custom orders and last minute Christmas dolls will have to be minimal. When I have something to sell, I will post it. 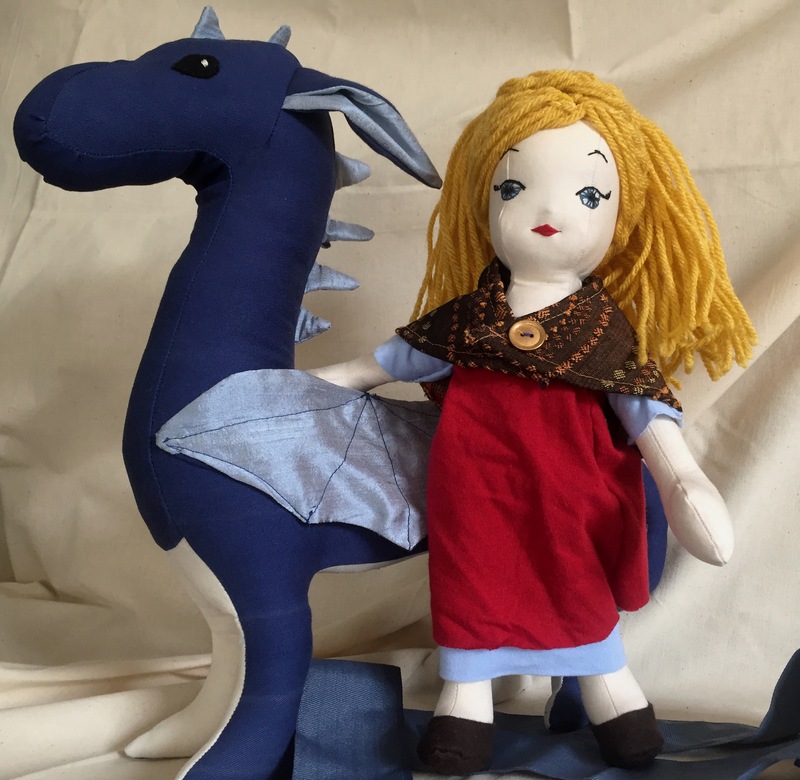 And I am reopening in February- not because it is a great time to sell dolls but to slowly build up a stock of inventory so that when/if a Christmas rush does come, I will be better prepared. All that to say- I have spent the last couple months trying out some new things. My dolls haven’t changed much- the biggest changes being I finally figured out a way to do 3D noses and I am now using yarn for hair. 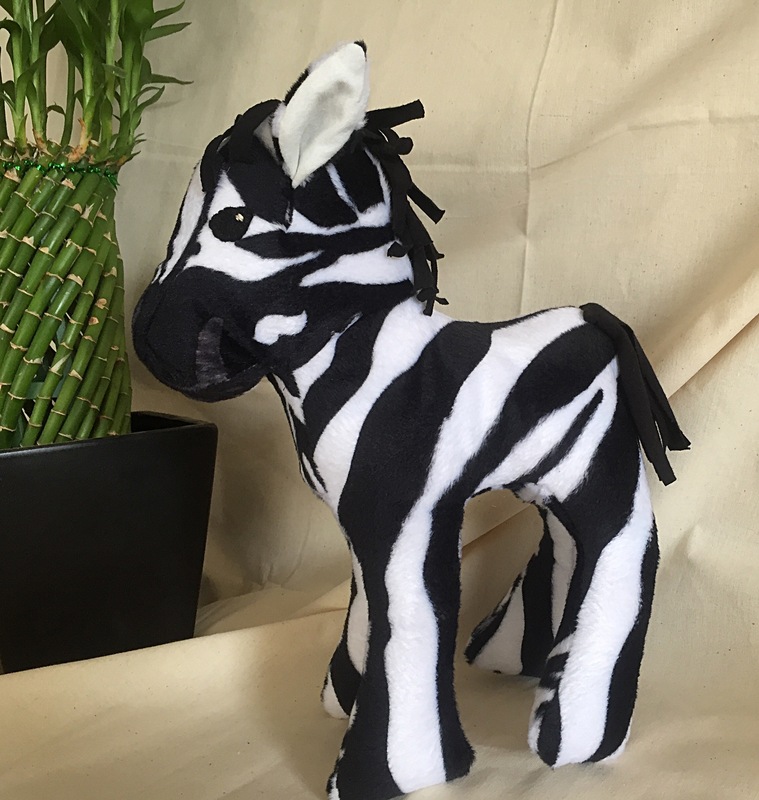 What’s been really fun is learning how to design stuffed animals. My old horse will always be a standby but I started in on unicorns and then figured, the skies the limit once you have the basic idea down. I designed a zebra, an elephant, a sheep, even a dragon! 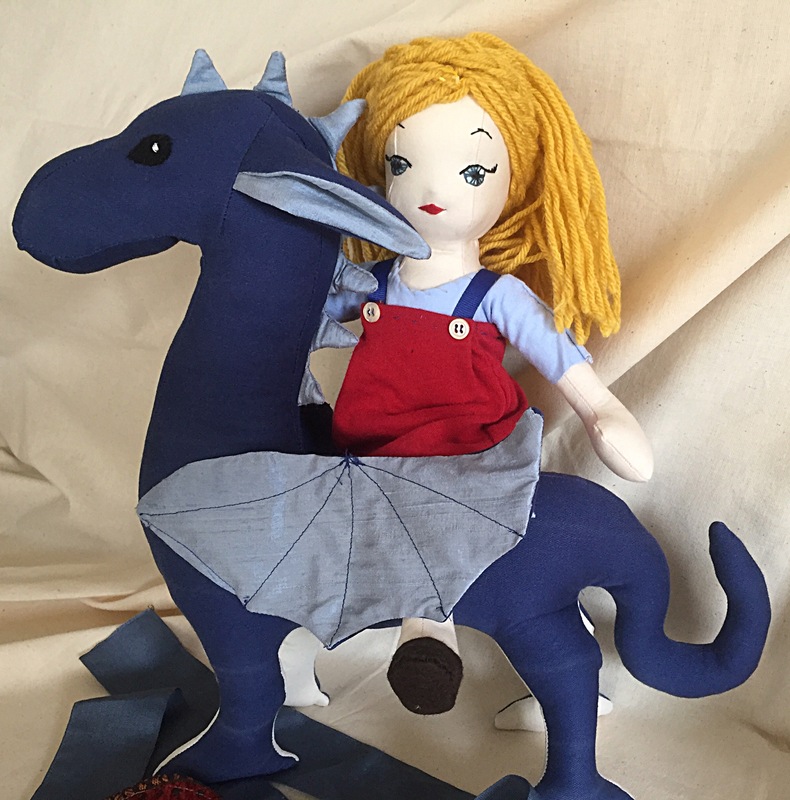 That led me to develop a new section of my shop- The doll and rider. 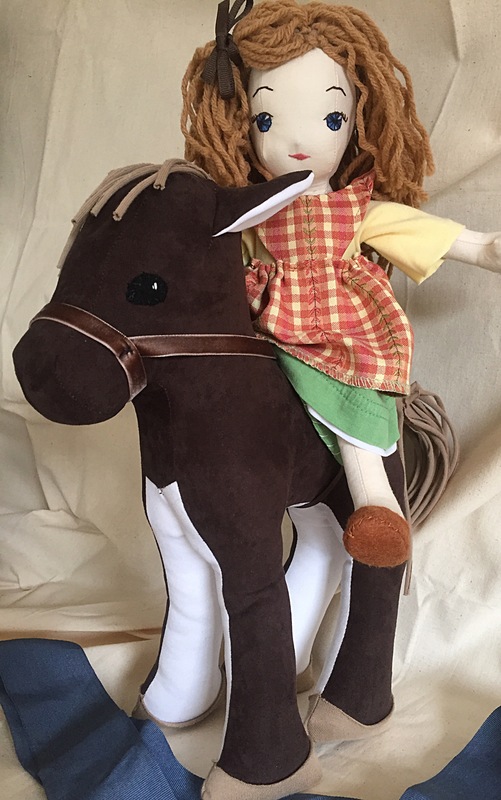 My horse and doll combo was always a good seller so I decided to make more combos, just for kicks. I am selling them as pairs or individually on my shop but I will introduce them here. My original combo, as I said was a horse and doll. 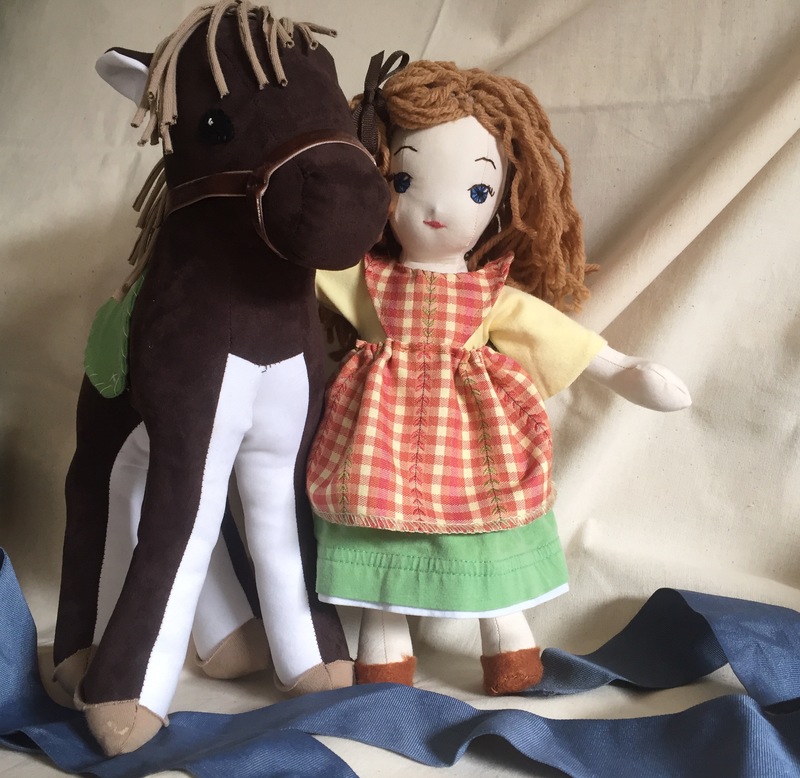 This is Susannah, my pioneer girl and her horse, Henry. I love her sweet face and her curly hair which I achieved merely by using the crinkly end of a skein of yarn! 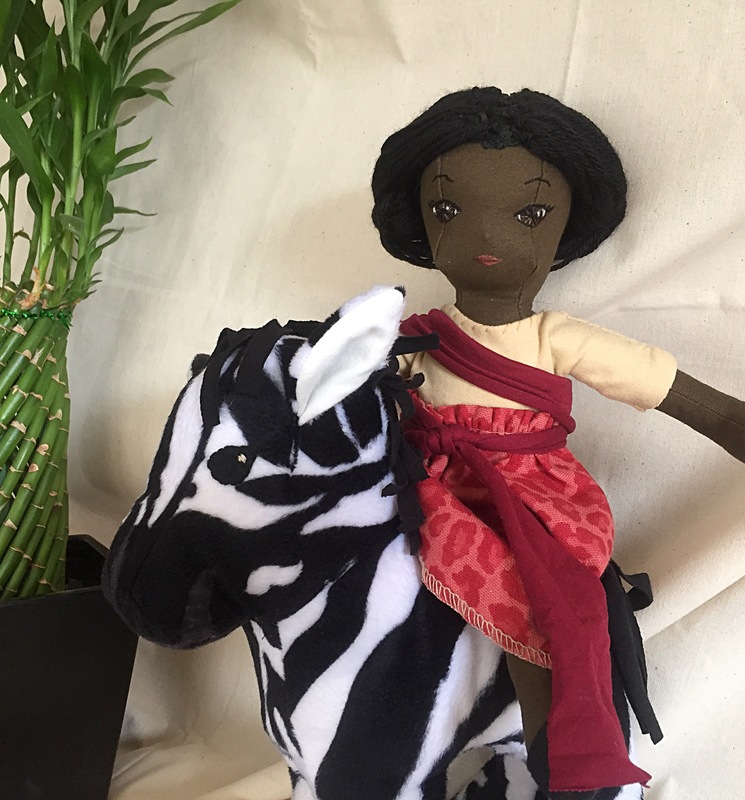 From there I moved on to another animal in the horse family- a zebra named Zeke who naturally needed an African girl named Zara to ride him. What other horses are there? Why magical ones with horns of course who are best friends with medieval girls named Cecily. I’m still debating a good Unicorn name. Ursula? Then it was time to break out of the horse world. 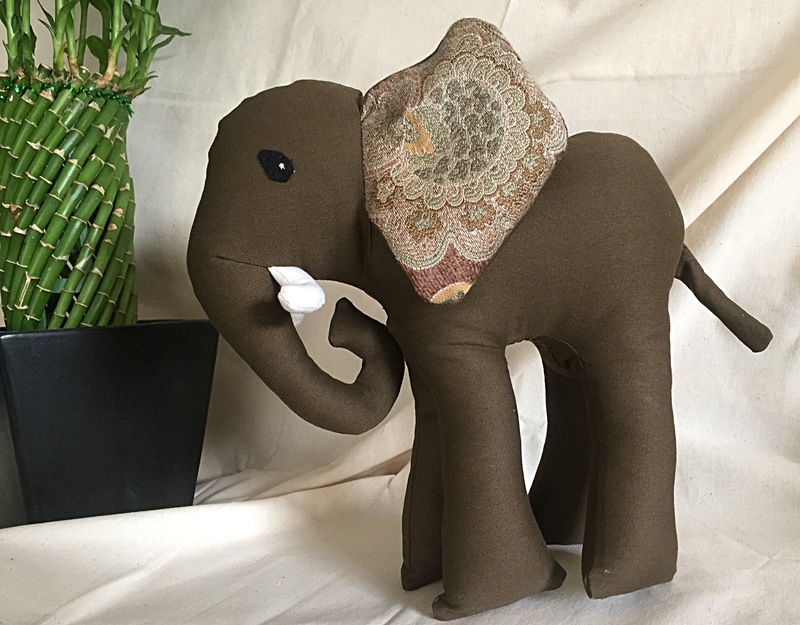 Why not elephants? And since I already had an African girl, it was time to go with Indian. This is Elliot and Ananda. 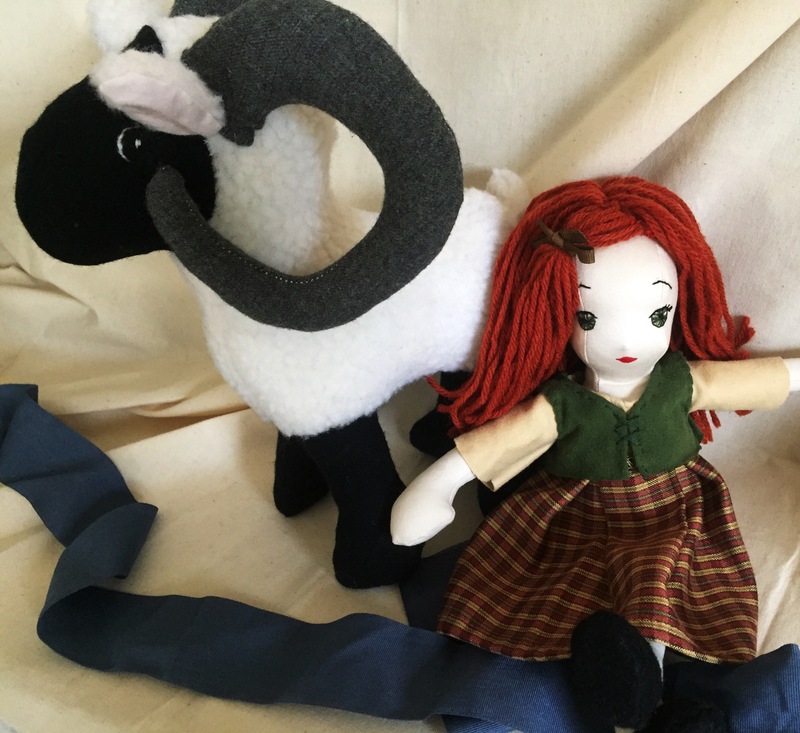 Now that I was going with different countries and because I love red hair, I had to do a Scottish lass named Bonnie. 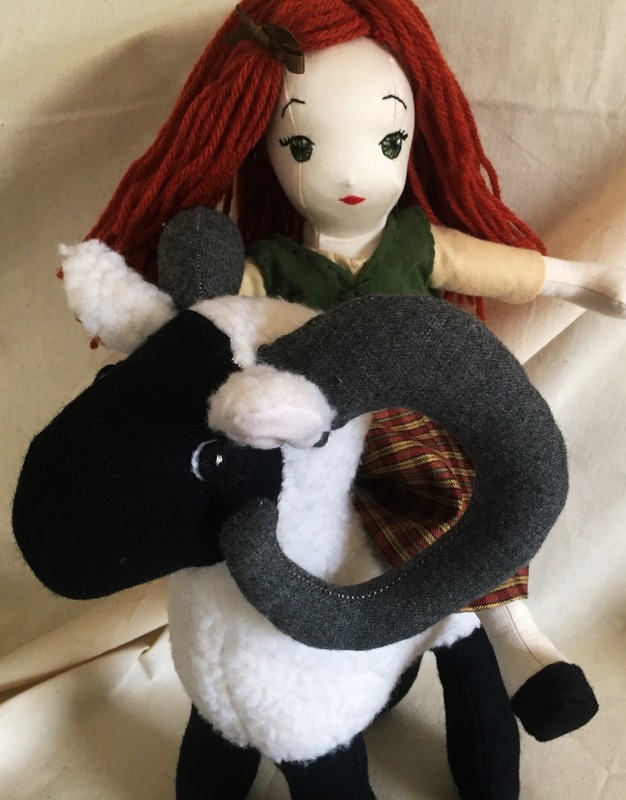 I had a hard time thinking of an animal for her to befriend and I’m not entirely sure that riding a ram is feasible but I love my little highland sheep just the same. 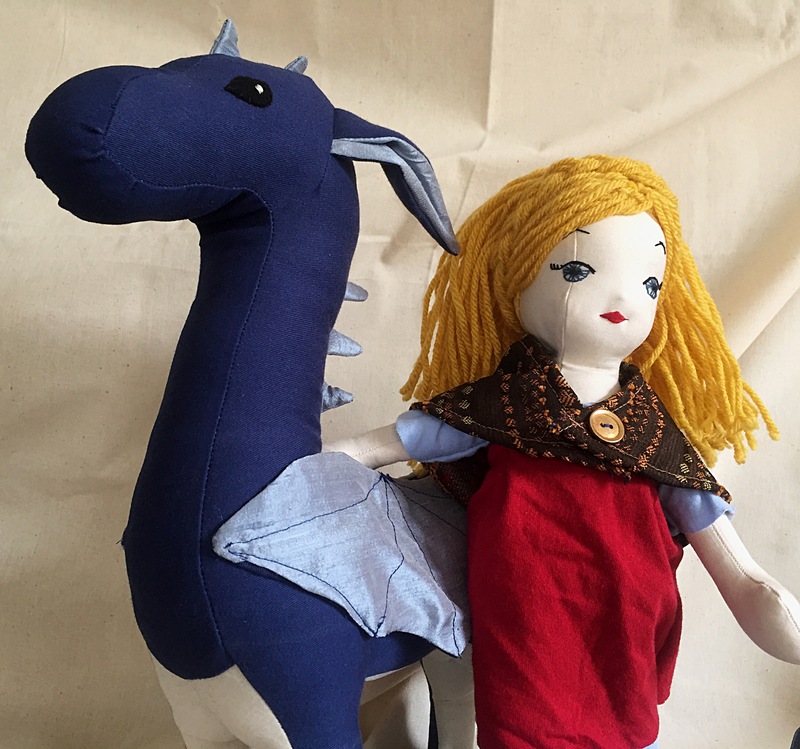 And last but not least, we reenter the magical realm, where sweet Scandinavian girls named Brigitte ride gentle flying dragons named Dexter or Drake. Which do you prefer? I would also like to do a little Chinese girl with a red dragon but I haven’t gotten that far yet. Phew! So that’s a start. 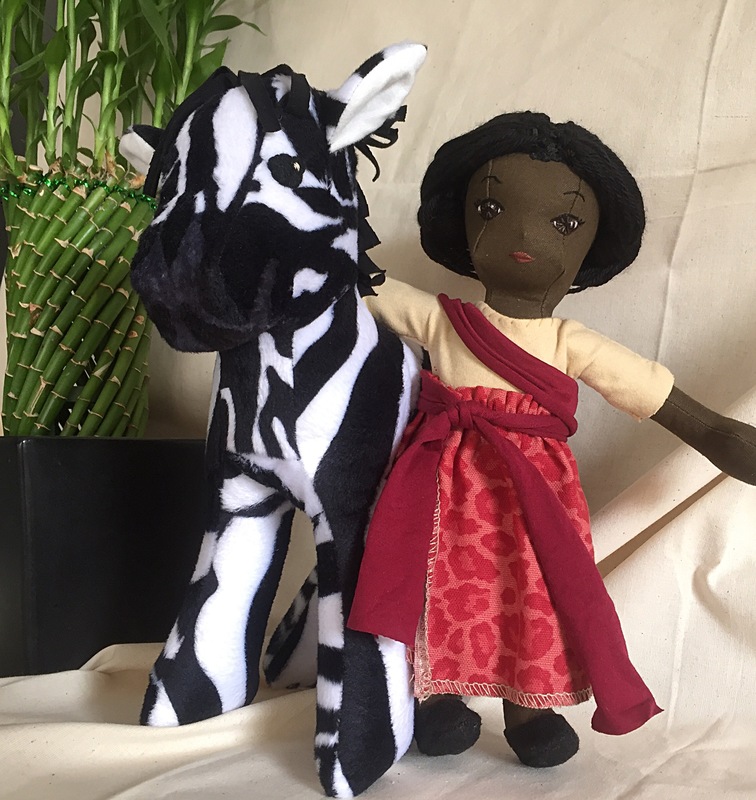 I’m hoping to get back to doing a greater variety of just dolls but for now, this is what I have. 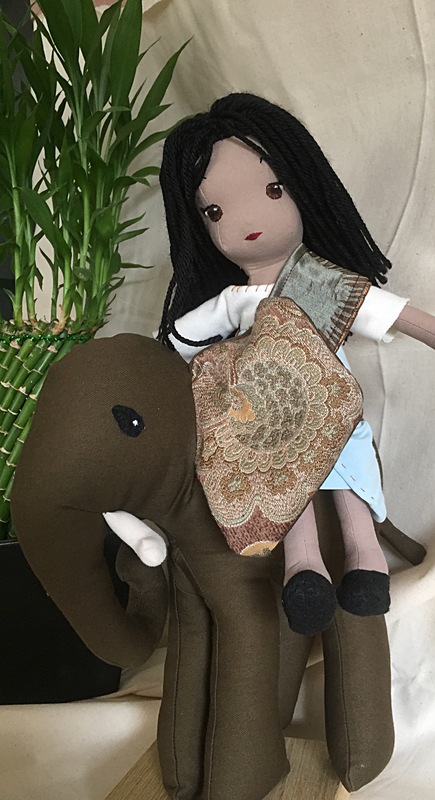 I have been able to collect quite a bit of feedback over these two years and have seen several specimens of these dolls that have really held up well. 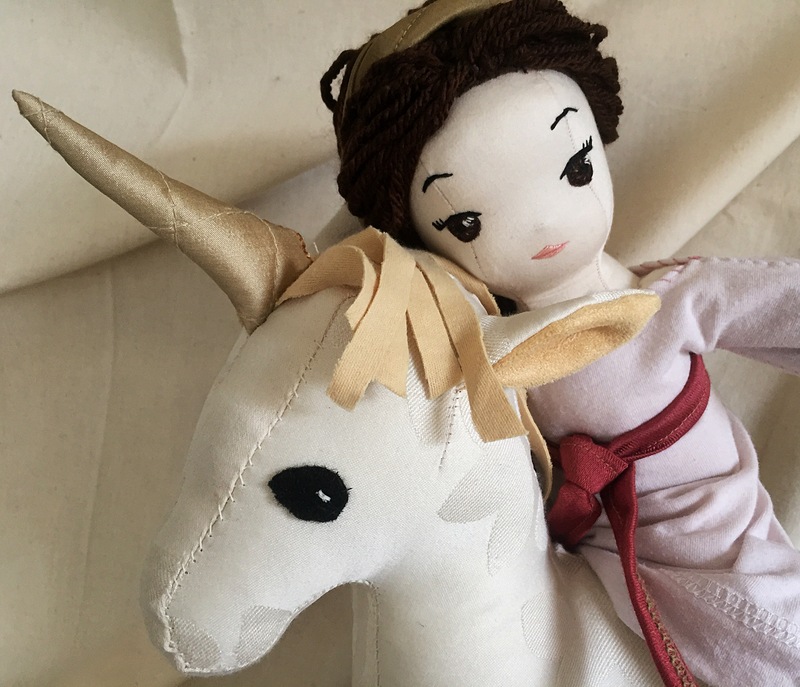 These dolls may look like delicate China dolls and I know several people who were afraid to purchase them for their younger girls but they really are very sturdy and can withstand a fair amount of abuse. Per the request of several, I am stitching the shoes and underclothing onto the doll so they don’t get lost but the stitches are easily clipped if you want removable shoes etc. Pricing these things is always tricky of course. Clearly they take me several hours to make, not to mention cost of materials and hope of some profit. But I always want them to be affordable and don’t like charging friends and family an arm and a leg. So the prices I have put on them are more of a test price. They may go up or down depending on sales. And as always, questions and feedback are welcome. Here’s a link to my shop just in case. And feel free to share!